All this for 36 cents! Ok, so I probably won’t get around to posting the full Albertson’s extravaganza of this last weekend, just as I haven’t gotten around to posting about the last several weeks of coupon deals. I have taken photos of most of them. This week at Albertson’s a confluence of high-value coupons (mostly from the Safeway Thanksgiving coupon book) and rock-bottom sales coupled with doublers resulted in MANY MANY free or nearly so items. 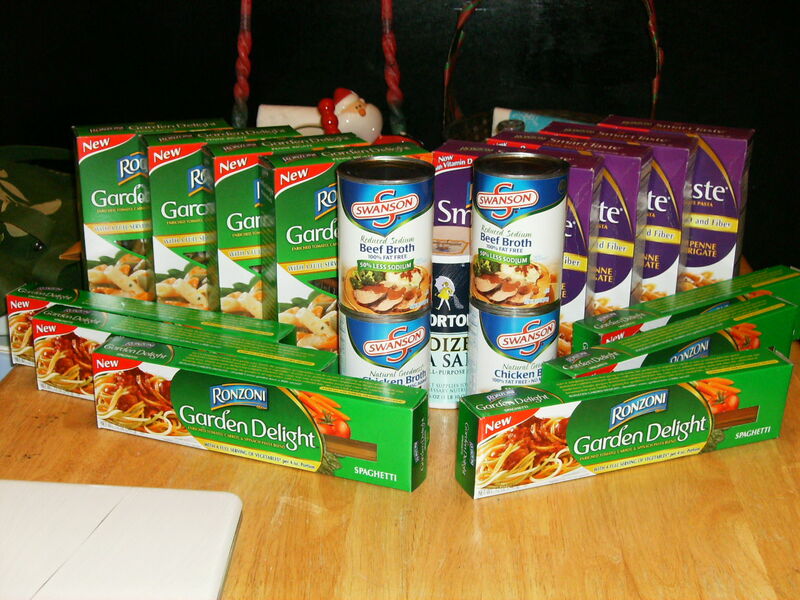 I have stocked up on Ronzoni garden delight and whole grain pastas, Swanson beef & chicken broth, salt, cream cheese, shredded cheese, fancy cheese, and hot chocolate. And by stocking up I mean like 40 cans of broth, 4 things of salt, 4 bars of cream cheese, 4 containers of Rondele spread cheese, 4 wedges of brie, 11 boxes of hot chocolate and roughly 30 boxes of pasta. I had to do this is many transactions over several trips because Albertson’s has a limit of only 9 doubler coupons per shopping trip (3 doublers at a time or 3 transactions at a time). I did 9 sets of doublers 5 or 6 times. I also took this opportunity to get all my baking supplies for Christmas cookies. Since this was done over several days, I don’t have a mass picture, but this is the last trip today. I will try after the holidays to tally up what I spent and list out what I bought. Should be exciting! For this trip, I used 4 doubler coupons. I couldn’t use doublers on the Ronzoni garden delights because they were priced at $1 and I had $1/1 coupons making them free already. Albertson’s does not allow you to use doublers to create moneymakers (although sometimes in larger transactions the cashier doesn’t keep track of that and it slips by). For a grand total of: $0.36! Soooo satisfying…..